The goal of this project is to perform a preliminary investigation on the quality, thoroughness, and implicit biases found on the semantic web. The focus of my work is DBpedia, a crowd-sourced community effort to extract structured information from Wikipedia and make this information available on the Web. As one of the largest source of structured semantic data on the web, the information found on DBpedia is incredibly important for many LODLAM projects. 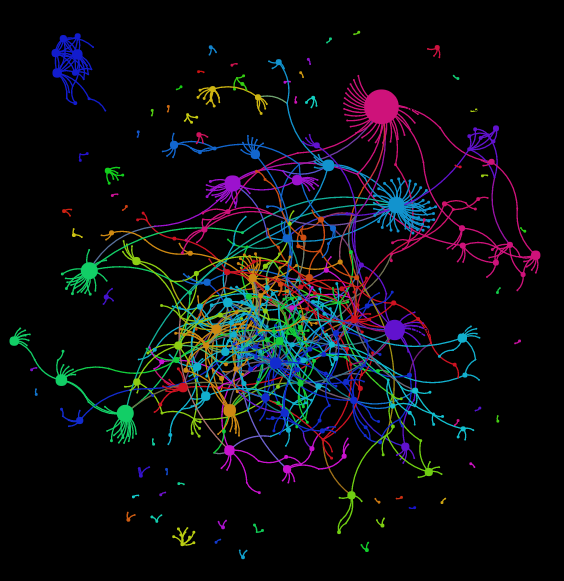 The investigation focused on particularly subjective properties in the DBpedia ontology: influences. These influence properties were examined for artists specifically in the domain of contemporary art. If these conditions are met, the script writes the “literal” name of each artist to the .csv file. This needs to be done because the script has been dealing with URIs this whole time, which wouldn’t be helpful as labels in the visualizations. After all the data has been written, the script performs one last step to remove all the duplicate rows of data in the .csv file and produces a final .csv to load into Gephi.